Nexter, a KNDS Group company, presents KATANA, the latest in 155 mm munitions. Nexter, through its Munitions directorate (Nexter Munitions, Mecar and Simmel Difesa), is one of Europe’s leaders in the field of munitions. Through an ambitious Research & Development (R&D) policy, lasting several years, the group now offers one of the most comprehensive ranges of highly technological munitions. The KATANA munitions can be fired from all 52 caliber artillery systems, while retaining the traditional artillery qualities: continuous fire, all-weather capability, high cost/efficiency ratio. 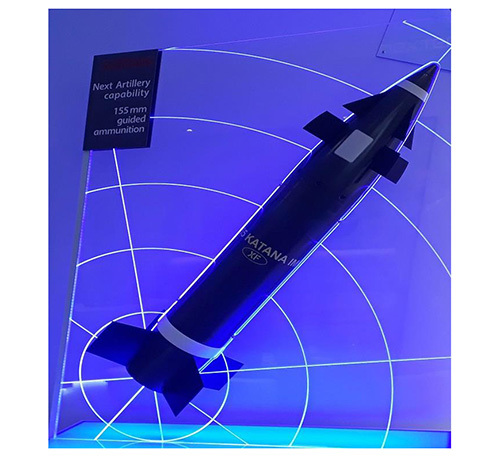 Thanks to its specific architecture, KATANA can be used for close support and will treat all types of targets thanks to its multi-mode rocket, which is programmable to operate by proximity, impact, or with delay: allowing the penetration of the military payload. With a maximum range between 30 km for the first generation and 60 km for the next, KATANA will strike targets with pinpoint precision. The projectile's guidance is ensured by a hybridization between a GNSS signal receiver and an inertial measurement unit. In the future, meter scale precision will be accessible through the addition of an optional semi-active laser distance gauge. Thus, KATANA shells will offer the best performance in range, accuracy and terminal effect for existing 155 mm munitions. With KATANA munitions, Nexter has a full range of 155 mm projectiles, compatible with current and future artillery systems. Nexter, the leading French land defense company and third European player in the ammunition sector is part of the KNDS Group. It is dedicated to meet the needs of the French land forces and of Nations on an international scale. The scope of its business includes as well the supply of weapon systems and ammunition for air and naval forces. Nexter also provides systems and protection solutions in the field of homeland security. The group’s range of products also includes ARAVIS®, TITUS® and VBCI armored vehicles, CAESAR®, TRAJAN® and 105LG1 artillery systems, smart ammunition (BONUS), many equipment, as well as customer service, support and revaluation. Nexter’s 2017 turnover amounted to €900 million, of which 18% is allocated to Research and Development activities.